Every once in a while, I get delusions of grandeur and think I could actually be an illustrator. Usually reality creeps back in to my mind in time, but occasionally I get some pretty good concepts and drawings out of the process. Here is one such case. 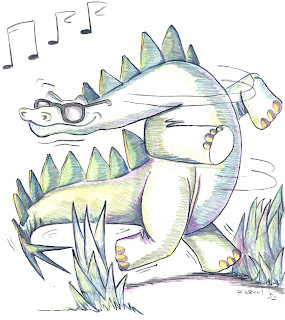 I love the idea of a great big lumbering stegosaurus getting up on his hind legs with a good pair of cheap sunglasses, and dancing something like the jitterbug!! Somehow, this drawing hit everything just right; the amount of detail, the proportions, the attitude, the color, the action, all work together to make a great composition. None of the other drawings came out as well as this one....back to the drawing board!!! !